After hundreds of Arab rioters target Erez crossing on Gaza border, IDF announces closure to repair checkpoint. The IDF has closed the primary crossing point between Israel and the Gaza Strip, after the checkpoint was damaged by Arab rioters. 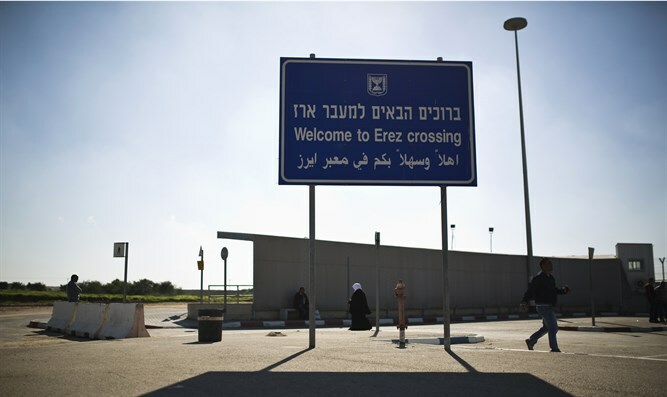 An army spokesperson said Wednesday morning that the Erez Crossing on the border of the northern Gaza Strip had been closed, and that no crossings would be permitted at Erez until damage done to the checkpoint has been repaired. On Tuesday, hundreds of Arab rioters in the Hamas-ruled Gaza Strip hurled rocks at the Gaza side of the crossing, damaging the checkpoint. “Yesterday a violent riot was instigated in the area of the Erez Crossing, with the participation of hundreds of Palestinian rioters. The rioters hurled rocks and damaged the infrastructure of the crossing on the Palestinian side,” the IDF spokesperson said. Despite the closure, the spokesperson added, Israel will permit emergency crossings on humanitarian grounds. While Israel maintains other crossing points with Gaza, Erez is the only point of entry or departure for travelers between Israel and Gaza. The Kerem Shalom and Karni crossings are limited to the transfer of goods.